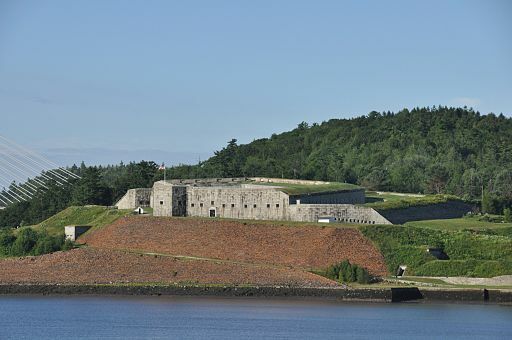 Fort Knox in Prospect, Maine is the most visited national historic site in Maine, and with good reason. This fort was never attacked, which is good for us. It means we have one of the best-preserved original forts in the nation. Maine is well worth a visit, too. The construction of Maine’s first granite fort was begun in 1844, overlooking the Penobscot River. It is positioned to guard a narrow channel through which all enemy ships going up the river would have to pass. A stretch of the Penobscot between Bangor and Castine had seen some conflicts during the American Revolution and the War of 1812, and British naval forces controlled Penobscot Bay for a time. A fort in the area was planned as early as 1825, but was not built for two more decades. 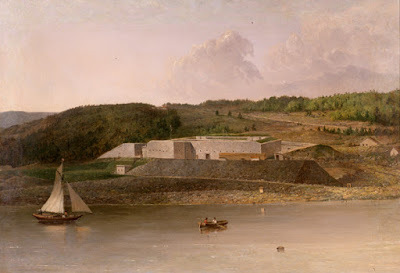 Painting of Fort Knox by Seth Eastman, done in the 1870s. The fort was approved when tension again arose with Britain, this time over the Maine-New Brunswick border. The U.S. did not want to see the city of Bangor and other resources along the Penobscot claimed by Britain again as a result of the border dispute. Building the fort cost almost a million dollars. Congress appropriated money in pieces for the construction, which continued until 1869. The cannon batteries nearest the river were built first, and then the fort itself. The fort’s two levels and four batteries contain mounts for 135 cannons, although no more than sixty-four were actually installed. The granite in the fort was quarried at Mount Waldo, about five miles upriver. The huge blocks were carried by barge down the river to a wharf at the building site. The granite work and brickwork in the fort are examples of fine craftsmanship. The main fort measures 252 by 146 feet. The two levels of the pentagonal fort contain mounts for 64 cannon. Four batteries cover four lines of defense outside the fort, with mounts for about 70 more cannon. The hot shot furnaces for the batteries are still in place. Rodman gun inside the fort. Photo by Leonard G.
At one time, many more structures were on the fort grounds. An 1870 officer’s report lists officers’ quarters, men’s quarters, a blacksmith shop, carpenter shop, office, large barn, kitchen building and implement houses. The fort was manned during the Civil War. Up to 117 Maine volunteers, some in training, were stationed there from 1863 to 1866. The fort was still under construction, and troops lived in temporary wooden buildings behind the fort. During the Spanish American war, it was again manned. About 575 troops from Connecticut were garrisoned here. They lived in large tents outside the main fort structure. During both these wars, no enemy ships appeared on the Penobscot River. The garrison was reduced to one man, the "Keeper of the Fort," upon their departure at the end of the war. The keeper, Ordinance Sergeant Leopold Hegyi, lived alone at the fort for thirteen years, attending to the maintenance of the fort. On July 16, 1900, a local fisherman noticed that the flag was not flying over the fort. He went to investigate and found Sergeant Hegyi very ill and went to fetch a doctor. Hegyi died the next day, and he was buried in the Narrows Cemetery in Sandy Point, Maine. Other military men took turns after that maintaining the fort for shorter periods. In 1923, the federal government declared the fort excess property and put its 125-acre grounds up for sale. The state of Maine bought it for $2,121. It is now a Maine state historic site and was declared a National Historic Landmark in 1970. Fort Knox Historic Site makes a wonderful family outing. It is open 9 a.m. to sunset, May 1 to Oct. 31. Take flashlights and a picnic! Love Maine? Leave a comment below to be qualified to win a copy of Susan’s Maine Brides collection. Be sure to leave your contact information. I have never been to Maine but it is one of my dream trips to take in the fall. Me too! Further north is gorgeous! That does sound like a cool place to visit--if I ever get to go to Maine. I'd love to do a fall tour of the New England states one of these years. O, me too! Love the fall foliage tours! I've driven through upstate NY and PA, but not that far north to Vermont or Maine that I've heard is beautiful that time of hte year. I've been to Maine for the Lobster Festival, but did not have the opportunity to visit Fort Knox. I love to visit historical sites, including battle sites. THanks for sharing! Susan is having trouble replying to your comments. I hope she'll be able to chime in before the day is over. I am from Kentucky and I never knew that another state had a Fort Knox. I woukd love ti visit Maine and see it. Thanks for this informative post! Thank you for your great post, Susan! I visited Maine for the first time a few years ago and loved it! That is so interesting. I did not know there was more than one Fort Knox. I would love to go to Maine someday especially to see fall colors. spotts06ATcomcastDOTnet. I'd love to visit there someday! My husband has the National Parks passport book and would like to have them all stamped before he dies :) I visited Maine as a teen on a family road trip and that's where I had the best fish in my entire life. Your book sounds great- thanks for the giveaway!!! I am finally here--so sorry to have not been able to take part in the discussion yesterday. All my life I heard about the Fort Knox in Kentucky. Now I live just a few hours from it. We loved to go through the long dark tunnels with just little gun embrasures for windows. Don't go without flashlights! Thank you Susan for the lovely tour of Fort Knox. I haven't been to Maine but it is on my list of states I would love to visit. 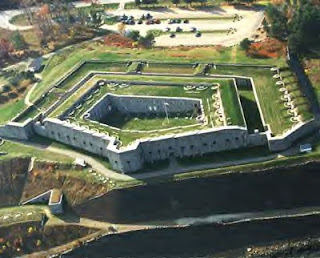 I spent every summer at Sebago Lake Maine my grandparents would take us to see some sites but never did see this fort. cheetahthecat1986ATyahooDOTcom. Thank you all for your interesting comments and for taking part. The winner is Stella Potts. Stella, I will contact you. I hope you all enjoy the "Fall in Love with a Good Book" page, our new feature on the 30th of the month. See you next time!